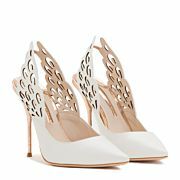 Our classic Angelo has been updated this season with a higher heel height. 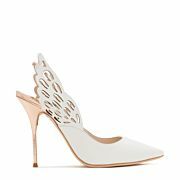 Chic white leather slingback finished with a stunning rose gold Angel Wing detail, this also makes a beautiful bridal shoe. 100% Calf Leather Upper, 100% Calf Leather Sole. Please note this style does not have a screen-printed sole.